Insight Signals helps companies understand, organize and gain competitive insights using corporate email data analysis. Whether used for sales or account management, email monitoring and analytics reveal best practices, team accountability, and opportunities for improving revenue and reducing data entry. 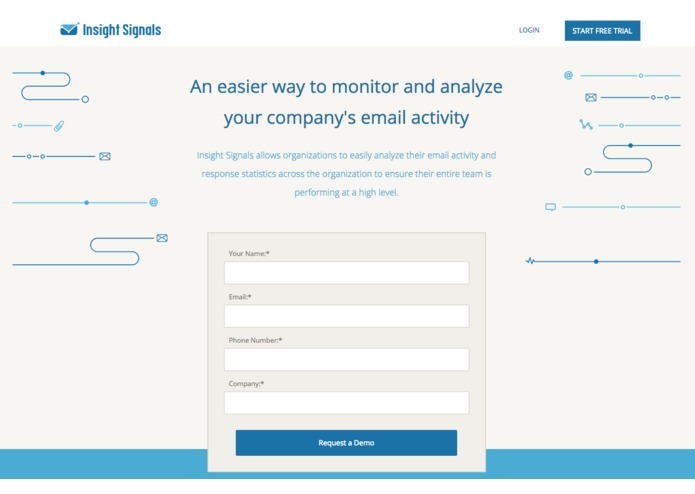 Instead of examining a single inbox at a time, Insight Signals offers users a single view into all of the email activity across her or his organization, showing levels of email activity both within and outside of the organization per individual and how individuals are connected to external companies. We have built a robust, cloud-based system capable of scaling out to millions of emails that: -allows users to connect accounts to context.io -syncs email data between context.io and our own write-once, read many (WORM) data store -performs ETL between our WORM store and our analytics database (postgres) -analyzes the email data using both stream- and graph-based approaches -pushes the results for exploration to Firebase with a backbone.js app providing the end user interface. Insight Signals continues to onboard B2B customers and develop new features. One of main new features being developed is integration capabilities with different CRM systems to both put our data back into the end users workflows and provide more insightful data to sales and account management leaders.